Is it possible that well known and often visited islands will ... disappear? There is a concern that the Maldive Islands will be flooded by the ocean. Is it possible to prevent this from happening? The government has already been wondering how to save this beautiful land. 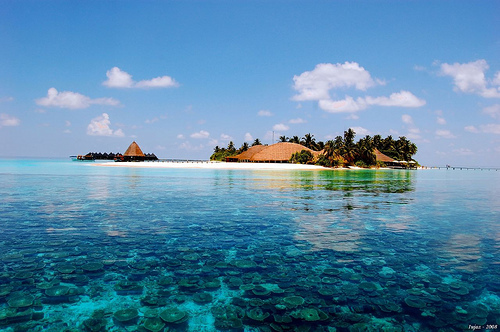 Maldives are a small country that consists of 1190 islands, it is located in the Indian Ocean. They are known primarily as a popular destination for tourists from all over the world. The islands are placed in atolls formed from coral reefs. They are characterized by a beautiful landscapes and clean water. No wonder that tourism, and also fishery, are the main occupations of the locals. Despite its popularity, nature cannot be fooled. As experts estimate, in a few decades these islands may disappear. Global warming is the reason. The increase in global temperatures result in rising sea level. As a result, there is the risk that many lands will be flooded. According to the calculations, as a result of this phenomenon, only a 90-inch piece protruded over the water is what will remain from Maldives. Thus, the whole country will practically disappear from the map. The state government is trying to prevent it. The Japanese built years ago in Male, the capital, the wall which is supposed to protect against high water. Unfortunately, it is impossible to apply similar solutions in other regions of the country. Therefore Maldives’ authorities have decided to find a new land, where residents will be able to settle down. Considering moving to Sri Lanka or Australia, the authorities are planning to move the entire country! This would be the first event of this type in a history.